Irvine, CA — From BOTOX® Cosmetic to facelift and rhinoplasty to laser skin resurfacing, cosmetic facial plastic surgery procedures continue to grow in popularity. Due to this increase in the number of procedures performed every year, Dr. Ali Sepehr says choosing the right plastic surgeon can be one of the most important factors for ensuring safe treatment and achieving optimal results. He says an ideal facial plastic surgeon will devote time and individualized care to every patient throughout the entire procedural process. Many surgeons offer facial treatments; however, he stresses the need for patients to research each doctor’s credentials before allowing them to perform any type of treatment, be it surgical or non-surgical. When performed by the right hands, plastic surgery can be a safe and effective method of achieving one’s cosmetic goals. Dr. Sepehr also says the decision patients make when choosing their surgeon can make all the difference in reaching those aesthetic goals and gaining the confidence and self-esteem that led them to this journey in the first place. A graduate of the University of California, Los Angeles School of Medicine, Dr. Ali Sepehr is the founder and medical director of The OC Center for Facial Plastic Surgery. He is a specialist in facial plastic surgery and is committed to optimizing the care and experience his patients’ receive. Dr. Sepehr is a member of many medical organizations including the American Academy of Facial Plastic and Reconstructive Surgery and the Head and Neck Optical Diagnostics Society, among others. He is well-respected in the medical industry and received the Reuther Kris Conrad Merit Award in 2010 for his outstanding work and performance in his field. The OC Center for Facial Plastic Surgery can be reached by phone at 949-371-6963, and is located at 16300 Sand Canyon Ave Suite 201 Irvine, California 92618. 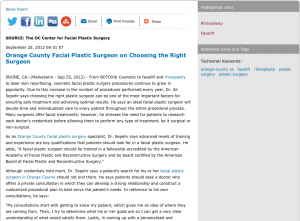 Dr. Sepehr can also be contacted by visiting orangecountyfacialplasticsurgery.com or facebook.com/ocfacialplastics.